There is a new release over at Simon Says Stamp today! It is called Fun and Festive and I have the fun of playing with a gorgeous new set called Winter Scene and I am making a festive card. 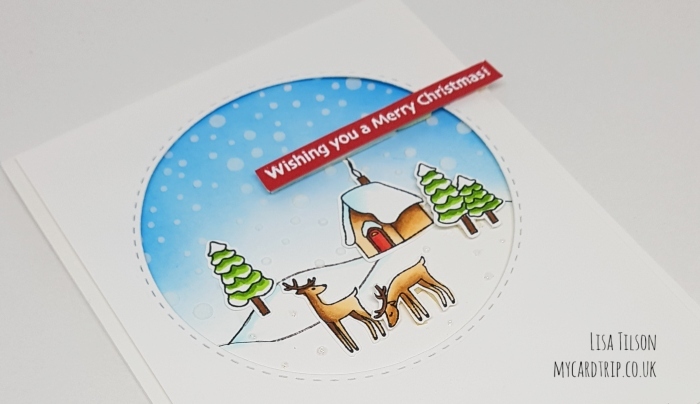 The set is full of sweet images that you can use to create a Winter/Christmas scene card. 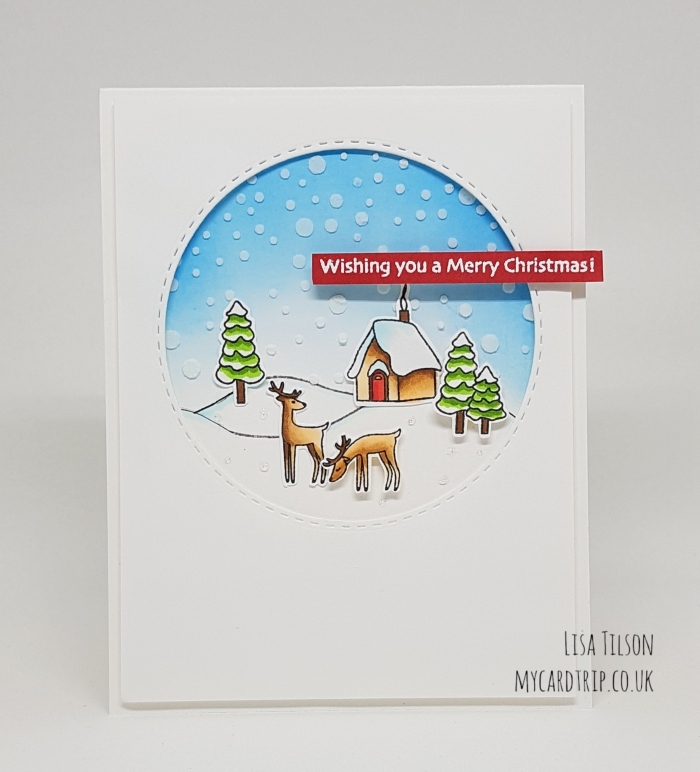 I haven’t used all the images on this card – there are some lovely lights you can add, plus some stars, mountain tops and a moon – so a night time scene can definitely be created too. I began by cutting a small panel of white cardstock – enough to sit behind the circle aperture. I stamped the snow banks from the set using MFT Hybrid Grey Ink. I had to mask off the outline from this particular stamp as it has a rectangle around the outside and I just wanted the snow bank portion of it. I also extended the snow bank lines outwards a little bit with a Copic marker so they would reach the edges of the circle. Next I blended Salty Ocean and Tumbled Glass Oxide Inks onto the top of the panel above the snow banks. I then took my SSS Falling Snow stencil and applied white embossing paste through the stencil with a palette knife. I added quite a thick layer – it’s difficult to see in the photo below, but you can see it better in the two other photos. I left that to dry and then worked on my images. These were stamped onto Neenah Solar White cardstock using Memento Tuxedo Black Ink and then Copic coloured (numbers listed below for reference). I then fussy cut them out and set them to one side. The front panel was made by running a SSS Stitched Circle Die through my machine with a piece of Neenah cardstock that had been trimmed to 4″ x 5.25″. I adhered the snowfall/inked panel onto a standard sized A2 base card with DST and then the circle aperture panel on top. The top panel has foam tape behind it so there is dimension. The images were then glued with either wet adhesive or foam tape depending on their position. The sentiment was stamped onto red cardstock with Versamark Ink, white powder added and then it was heat embossed and trimmed to size. This was then attached to the panel with foam tape. Lastly, some shimmer was added to the trees and the snow on the house. You’ve got to have a bit of sparkle on a Christmas card. With that in mind, I also added a few dots of Star Dust Stickles onto the snow so it twinkles every now and again in the light. That finishes my card for today. Thank you as always for your visit, I appreciate you all so much. And I will be back with another project soon. Perfect winter scene, colours are just right. Thank you. I love this! Your coloring and the snowy background – it’s just perfect!